Suthep going after Shinawatra companies – includes ADVANC&INTUCH? Huh what? Thats news to me, ADVANC and INTUCH still belong to the Shinawatra family? Really? Wait a minute, wasn’t it when Thaksin sold his shares to the Singaporean investment Group that the yellow shirts first begun their hissy fit? 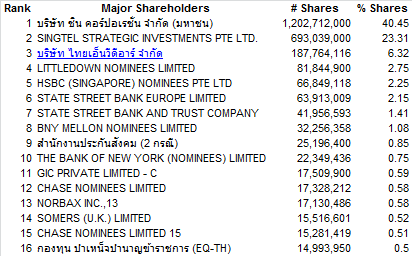 So INTUCH and Singtel are the major shareholders of ADVANC…ok, what about INTUCH then since Thaksin MUST HAVE a stake there? Oh crap, nope his name isn’t here again! INTUCH not added to the MSCI?